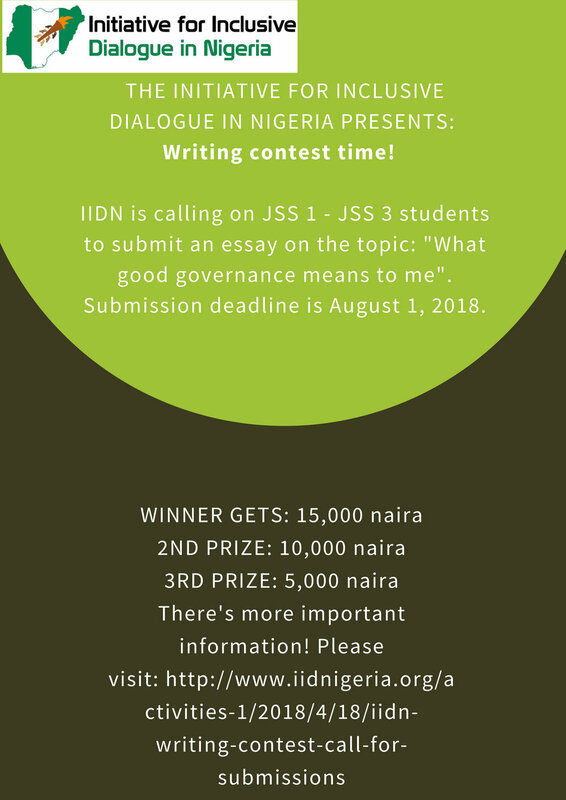 The Initiative for Inclusive Dialogue in Nigeria (IIDN) is pleased to launch a writing contest, targeted at JSS 1 through to JSS 3 students in Lagos, Nigeria. Essay submissions must be on the topic: What Good Governance Means to Me. Submission deadline is 11:00pm on August 1, 2018 (EXTENDED from May 20, 2018). Contestant should currently be enrolled as a JSS 1, JSS 2 or JSS 3 student in Lagos, Nigeria. Essay submission should be between 500 to 800 words (maximum) in length. Please email your essay to: info@iidnigeria.org. Signify in the subject line of your email that you are participating in the writing contest. Essay can also be sent in by contestant's self-identified guardian - in this case, please state clearly why the contestant is unable to send the email by him or herself. Each essay submission should clearly identify the names of the contestant, class and school enrolled in. By participating in this contest, each contestant gives IIDN permission to publish the submitted essay (names included) on the IIDN website, should we choose to. We look forward to reading submissions from the future leaders. Let the writing begin! Thank you!